3' Foot Premium 24 kt Gold Plated Double Insulated Cable with Near Perfect Impedance. 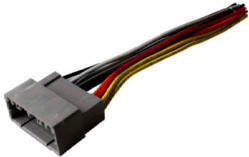 If you are installing an aftermarket radio in your car you need this harness. This harness will save you time and aggravation. To use it simply unplug your factory radio from the harness in the dash. On the aftermarket radio wire this in by matching up the colors. Our harness meets EIA color codes to take out the guess work. Then simply plug the aftermarket radio back in to the factory plug in the vehicle. 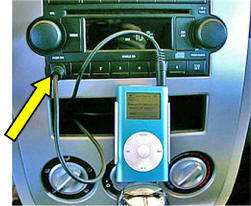 No cut wires, if you sell your vehicle simply unplug the aftermarket radio and re-plug in the factory radio. The Ultimate Media System! Includes Navigation Disc. The MOPAR Navigation Radio (RB1) combines a 4.9-inch full-color display, AM/FM stereo, CD Player and Navigation System that utilizes DVD technology, all in one handy unit. This sophisticated, yet simple-to-use navigation system guides you to your precise destination through the use of Global Positioning System (GPS) satellite technology and an onboard computer. The system offers full mapping and turn-by-turn route guidance with voice instruction, automatic re-route calculation, unique smart-spelling feature, extensive listings for point of interests and enough memory to store 100 personal addresses. 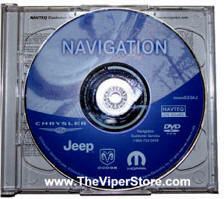 Unit includes a geographic DVD with routing directions for the entire mapped United States and parts of Canada. The radio features 10 AM, 10 FM, and 10 Sirius Satellite Radio pre-sets. 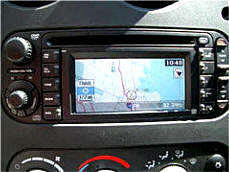 This system is Sirius Satellite Radio capable and displays station names, song title and artist. To obtain Sirius Satellite Radio a satellite receiver/antenna kit, installation kit and subscription to the Sirius service is required. RB1 Navigation Radio includes AM/FM radio with one-disc CD player with CD changer controls, display screen, GPS antenna and one DVD-ROM geographic disc covering all of mapped US and parts of Canada. Provides full mapping and turn-by-turn capability.